장옷이란 여인들이 외출을 할때 얼굴을 가리기 위하여 착용하던 두루마기와 비슷한 포(袍)의 일종으로 장의(長衣)라고도 함다. 겨울철에는 방한을 목적으로 솜을 두어 입기도 했으며 다른 포에 비교해서 비교적 다양한 색상을 사용하기도 했다. 옥색 명주로 만든 이 장옷은 소매끝에 흰색천으로 덧댄 거들치가 달려 있고 동정 대신에 엷은 흰색의 헝겊을 대어 착용할 경우 이마 위 정수리에 닿도록 하였다. 앞단추가 달려있어 여밀수 있으며 여기에 이중으로 고름을 달아 양쪽에서 손으로 잡아 매도록 하였다. 가장자리에는 가느다란 선이 둘러져 있고 깃은 쌍깃이며 겉감은 옥색이고 안감은 흰색이다. 앞자락은 4쪽으로 이어져 있으며 겉섶과 길 사이에는 장옷의 폭을 넓게 하기 위하여 무가 달려있고 소매가 길까지 깊이 들어와 달려있다. 겨드랑이 밑에는 바이어스로 처리된 보라색의 삼각무가 있고 보라색의 고름이 달려 있다. 뒷면을 살펴보면 등솔이 없는 것이 이 장옷의 특징으로 이러한 장옷은 치마형으로 만들어 사용했던 쓰개치마와 같이 당시 여인들이 외출할 때 꼭 필요한 것으로서 대한제국 말까지 사용하였다. The women’s overcoat or Jangot was worn over the head by women to cover their face when they went out. 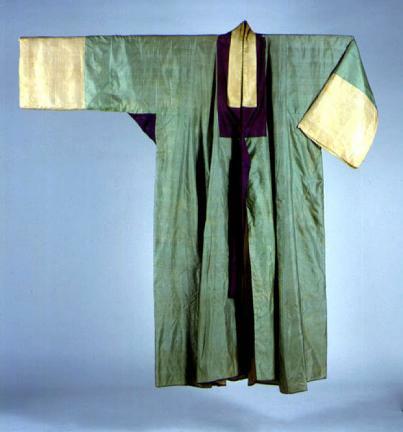 This veil looks similar to the durumagi (Korean topcoat), and it was also called Jangui. 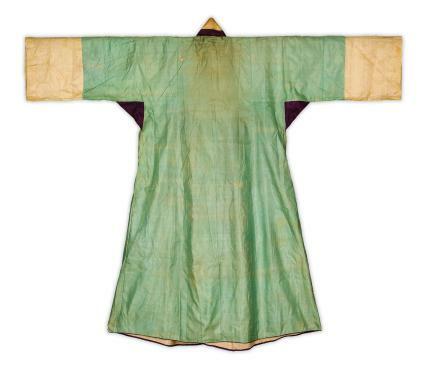 In winter, it was padded with cotton to keep the body warm. Jangot used more colors compared to other kinds of topcoat. 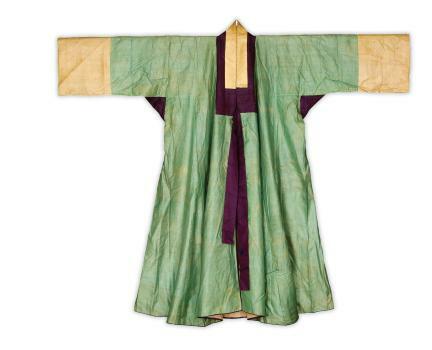 This jade-green silk jangot has white cloth instead of a collar strip attached to the end of the sleeves, so it comfortably lies on top of the head when worn. It has front buttons and goreum (little ties) to allow adjustment. The edges are finished with thin lines, and the collar is a double one. 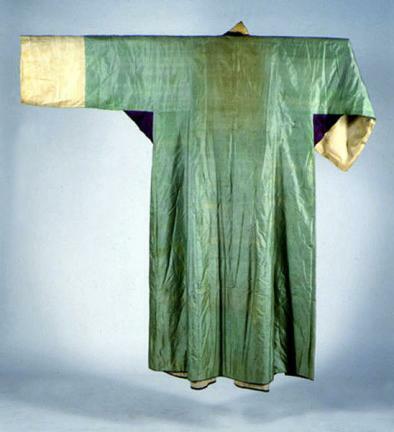 The outer side is light green, and the lining is white. The front side of this jangot has four pieces of cloth stitched together. Gusset is inserted between the outer long hanging sheet and the body to increase the width of the jangot. Triangular purple mu is used at the underarm sections, with purple ties attached to the chest area. One distinctive characteristic of this jangot is that there is no seam on the back side. 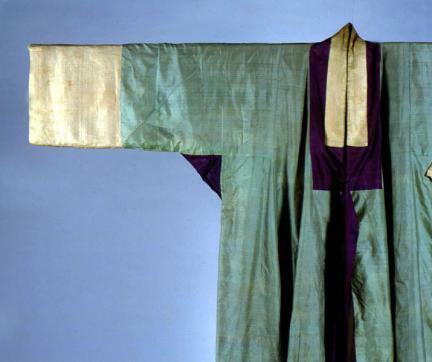 This jangot used to be an indispensable item for women when they went out at that time, along with sseugaechima (a kind of cover skirt) made in skirt style. It was popularly used until the late Korean Empire.